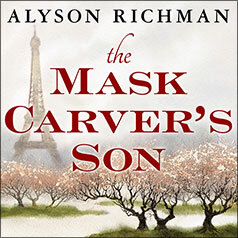 A Japanese art student must decide whether to follow his dreams or honor his father in this beautifully written novel from Alyson Richman. 1890. Yamamoto Kiyoki is a Japanese art student, dreaming of studying in Paris with the inspiring and vibrant Impressionist painters. Yamamoto Ryusei is Kiyoki's father. Ryusei's art, carving intricate masks for traditional Japanese theater, has been his refuge from loneliness since the death of his beloved wife, and he is revered as the most inspired artist of his kind. He expects his only son to honor the traditions of his family and his country, not to be seduced by Western ideas of what is beautiful. Ryusei hopes Kiyoki will follow his own distinguished career, creating masks that will become the family's crowning achievement. But what is a father to do when his son's path is not what he had planned? And how can a son honor his father, and yet fulfill his own destiny?